The University has a 25-strong team of grounds staff headed up by Grounds Maintenance Manager Gordon Eastham. Together they are responsible for maintaining the 500-acre parkland campus, plus grounds at the Kings Manor site with a year round programme of planting, pruning and grass cutting. The campus grounds are high profile and always on view; making it imperative that they are maintained to a high standard. As part of the expansion programme, Gordon and his team were tasked with supporting the biodiversity of the campus to make sure it is a suitable habitat for wildlife and wildflowers, whilst making it look attractive for students and visitors. Gordon contacted John Chambers Wildflower Seed for help and advice. 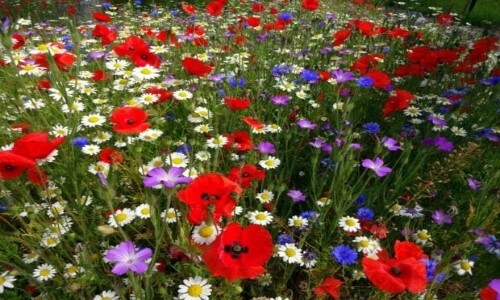 The John Chambers Wildflower Seed team advised on species, campus ground conditions and wildlife goals before suppling the most appropriate seed for the various areas to be planted around the campus, which made up around 10% of the university estate. The John Chambers Conservation Best 6 Annuals Mix featured heavily in the planting scheme and produced a spectacular display of colour. The mix includes Poppy, Cornflower and Marigold; the different colours and flowering habits are exceptionally complimentary to each other and produce a uniquely showy and colourful combination. On site visits were made and advice was given before, during and post planting to ensure this high profile, large-scale planting project was successful.